Throughout the world, people in impoverished countries bring a sense of humor to their automotive travails. Whether it be Africa, Asia, the Caribbean or South America, if you take local public transportation, you'll find yourself crammed in a rickety bus, often with animals, vegetables, and mattresses riding alongside you. It's a matatu in Uganda, a tap-tap in Haiti, a chicken bus in Guatemala, or a chiva ("goat" in Spanish) in Colombia or Ecuador. Crossroads Trade is pleased to present whimsical folk vehicles from many lands, bearing striking resemblances to their real counterparts. From Colombia, we offer chivas. The originals are elaborately painted, wooden-side buses. Ours, brightly painted ceramic renditions of the original, are a signature folk art of Colombia. The Peruvian ceramic cars and trucks have the discernable stamp of Ayacucho and Quinua. Our Haitian tap-taps are rendered as housewares - home goods, key chains, magnets and ornaments, fashioned from steel-drum-scrap. Our Guatemalan chicken buses are ornaments -- to hang from your tree or your rear-view mirror. Not everybody takes the bus. In Bolivia, people and animals pile into the backs of large open-air panel trucks, and ours, in wood and cloth, features men and women, alpacas, baskets, sandals, and tools. 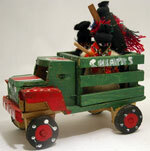 Our Zapatista truck from Mexico, also wood and cloth, carries masked freedom fighters in the back. There is some private transport in these countries, and we have some great examples. South Africans make cars and motorcycles from old cans, with wheels made from soda and beer bottle caps. From India and Burkina Faso, we have elaborate wire bicycles, made only using a pair of pliers. And from any number of countries, we have sturdy wire cars, motorcycles and front-end loaders. These vehicles always lift the spirits, uniting the adventure of travel, the ingenuity of recycling, and the self-expression of the artisan.